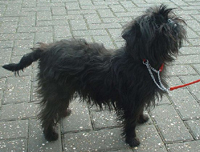 Affenpinscher Dogs - The Affenpinscher is a terrier-like toy breed of dog. Weighing 7 to 8 pounds (3-4 kg) and not exceeding 11 inches (24-28 cm) in height at the withers, the Affenpinscher has harsh rough coat and a monkey-like expression (Affe is monkey in German). His coat is shaggier over the head and shoulders forming a mane, with shorter coat over the back and hind quarters. It is harsh and wiry in texture. The FCI and UK breed standards specifies that the coat must be black, but the AKC also allows gray, silver, red, black and tan, and beige; other clubs have their own lists of acceptable colours, with black being the preference. This information is licensed under the GNU Free Documentation License. It uses material from the Affenpinscher article on Wikipedia.org. Affenpinscher Breeders - Advertise your kennel puppies and dogs here.